La Ferrassie 1 displays "classic" Neanderthal traits such as an occipital bun, a receding forehead, a long and low cranium, thick supraorbital tori, and relatively reduced midfacial prognathism. 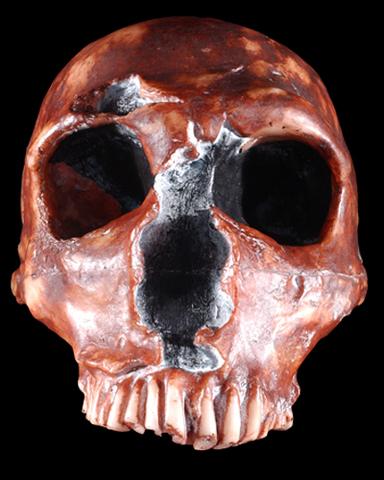 H. neanderthalensis have very large endocranial capacities, and La Ferrassie 1 is no exception with a relative brain size of over 1,600 cc1,2. La Ferrassie 1's teeth are heavily worn, especially the incisors which is sometimes interpreted that the individual used his teeth as if his mouth were an extra hand1. Scientists analyzed the labyrinthine inner ear structure of Le Farrassie 1, and determined that Neanderthals balanced themselves during bipedal walking in much the same way as modern humans. Neanderthals appear to run less often than modern humans, and were less active overall1. Johanson, Donald and Blake Edgar. 2006. From Lucy to Language: Revised, Updated, and Expanded. Simon and Schuster: New York. Klein, Richard G. 2009. The Human Career: Human Biological and Cultural Origins. The University of Chicago Press: Chicago.